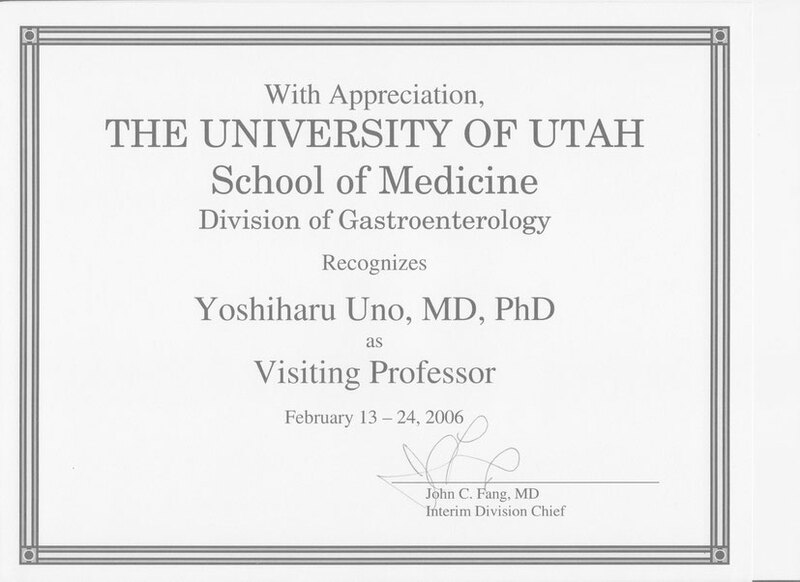 Office Uno ColumnChief : Yoshiharu Uno, Ph.D., M.D. April 23, 2015,　Uno PhD was observed a trademark monopoly of the low -FODMAP diet (LFD) from the Japanese government. The purpose of Uno is to prevent unauthorized LFD. Uno wants convey the correct LFD information at Japan. 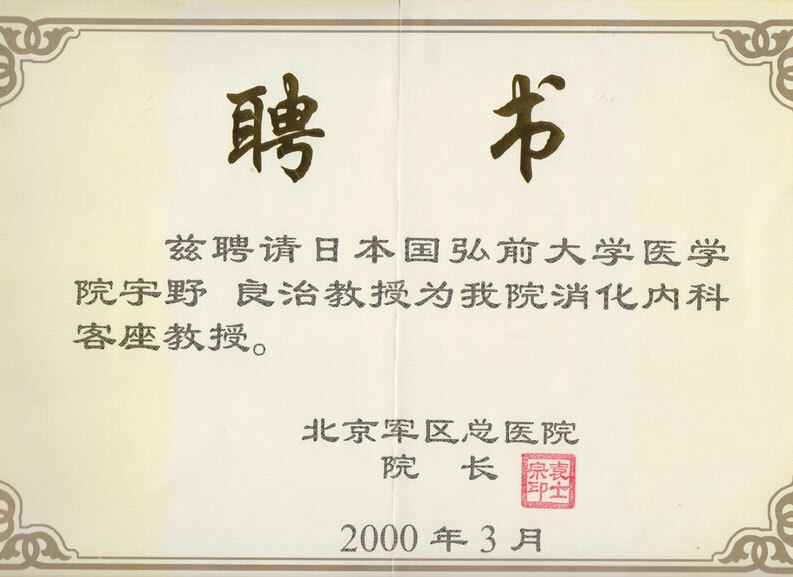 The patent contents are, education of LFD, guidance of LFD, information, and dissemination of LFD. 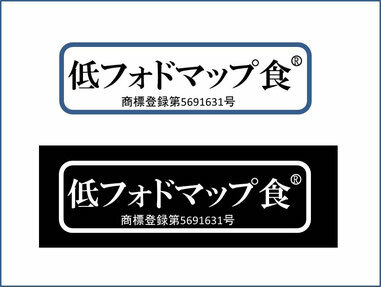 The efficacy of this patent is limited to Japan. In Japan, there is a unique problem. The Japanese food often contain sorbitol. For example, "Mentaiko" contains sorbitol. Also, Japanese marshmallows contains sorbitol. Japanese fruit contains fructose a lot by breeding. Component of Japanese tofu is almost the same as soy milk. Yoshiharu Uno PhD will become freelance from March in 2015. He accepts the consultation as a standpoint of PhD of Gastroenterology. And, he will respond to the writing of the comment and review. In addition, he will offer the new ideas by this column site. His ideas are likely to contribute to the development of medicine. He graduated from the Kitasato University (Kanagawa, Japan) in 1984. From 1984, he became a researcher of the digestive tract group of Hirosaki University School of Medicine. 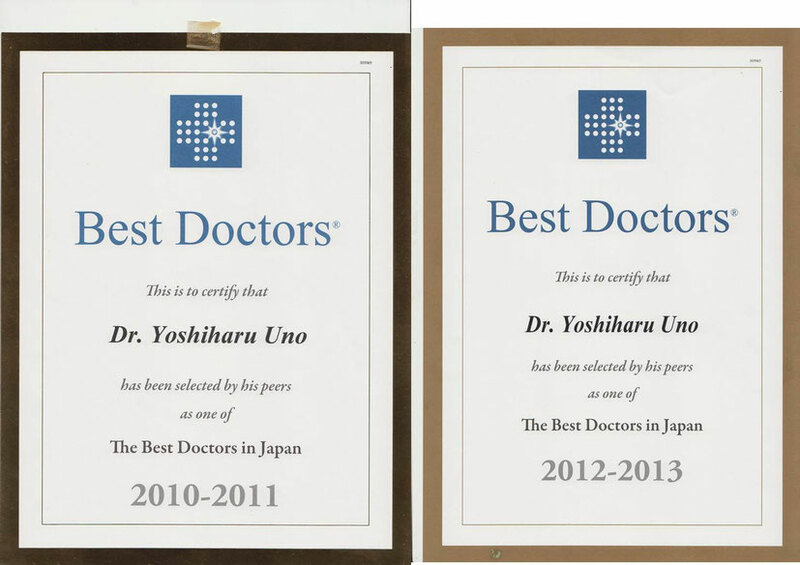 In 1994, he was certified Ph.D. of Hirosaki University School of Medicine. This article was published in 1995. Endoscopic and histologic correlates of colorectal polypbleeding. Introducer method of PEC was first reported by him in the world. Gastrointest Endosc. 2006; 63: 666-73. The first report in the world. Gastrointest Endosc. 1994; 40: 485-9. Gastrointest Endosc. 1999; 50: 329-3. Uno Y, van Velkinburgh JC. Logical hypothesis: Low FODMAP diet to prevent diverticulitis. World J Gastrointest Pharmacol Ther. 2016 Nov 6;7(4):503-512. Uno Y. Management of colon stents based on Bernoulli's principle. Uno Y. Enigma of Intestinal Gas in Irritable Bowel Syndrome. Am J Gastroenterol. 2017 Jul;112(7):1166-1167. Uno Y. Letter: low-FODMAP diet for exercise-induced gastrointestinal syndrome. Aliment Pharmacol Ther. 2017 Nov;46(10):1021-1022. Direct electrohydraulic lithotripsy by PDC was first report in Japan. He is one of the few Japanese who are opposed to the eradication of Helicobacter pylori. 1. Uno Y, et al. The discrepancy of histologic diagnosis between flat early colon cancers and flat adenomas. Gastrointest Endosc 1994; 40: 1-6. 2. Uno Y. Polypectomy on multiple polys. Gastrointest Endosc 1994; 40: 526-527. 3. Uno Y. Problems in the strip biopsy of pedunculated polyps. Gastrointest Endosc 1995; 41: 526-527. 4. Uno Y. Mental retardation and colorectal disease: Colonoscopic mass screening to determine whether the risk of adenomatous polyposis syndrome is increased in the mentally retarded. J Gastroenterology Hepatology 1996; 11: 275-258. 5. Uno Y. 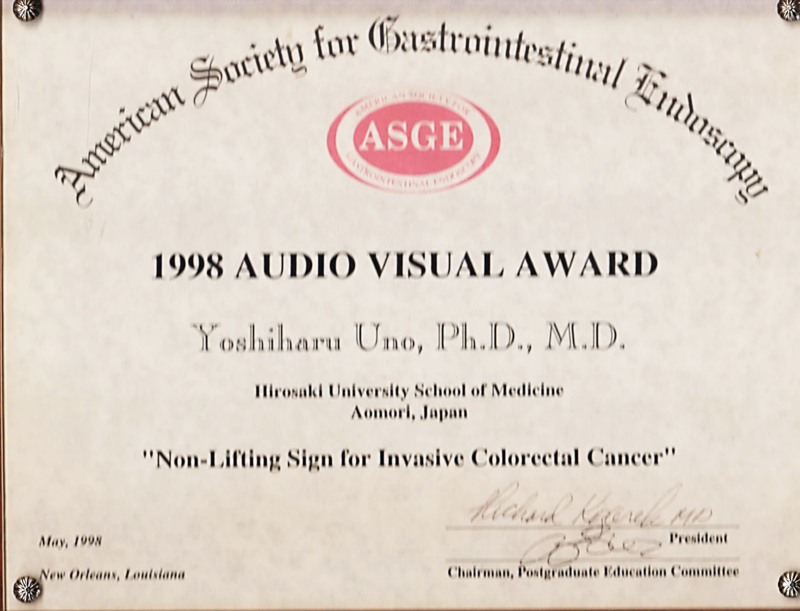 Color vison and endoscopic diagnosis. Gastrointest Endsc 1995; 42: 377-378. 6. Uno Y, et al. Enzymes in intestinal juice from patients with liver disease and colon polyps: Measurement of bilirubin, alkaline phosphatase, asparate aminotransferase and lactate dehydrogenase. Tohoku J Exp Med 1996; 178: 163-168. 7. Uno Y. Bacteremia after saline-assisted polypectomy. Gastrointest Endosc 1997; 46: 279-281. 8. Uno Y, et al. Cold snare excision is a safe method for diminutive colorectal polyps. Tohoku J Exp Med 1997; 183: 243-249. 9. Uno Y, Morita T. Colonic perforation and serosal tears associated with colonoscopy. The Lancet 1997; 349: 1888. 10. Uno Y, et al. Stent implantation for malignant pyloric stenosis. Gastrointest Endosc 1997; 46: 552-555. 12. Uno Y. Rotary biopsy forceps. The Lancet 1998; 351: 1408. 13. Uno Y, et al. Endoscopic lagation for bleeding rectal varices in a child with primary extrahepatic portal hypertension. 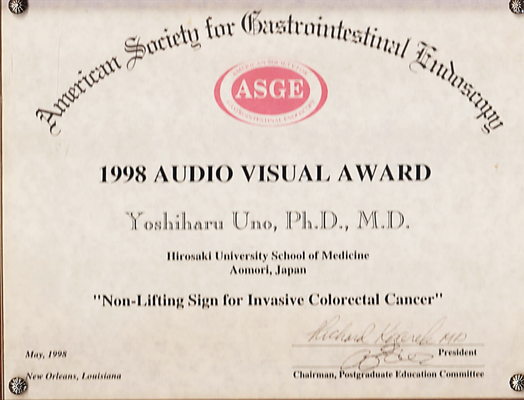 Endoscopy 1998; 30: S107-108. 14. Uno Y, et al. Endoscpic ligation by means of clip and detachable snare for management of colonic postpolypectomy hemorrhage. Gastrointest Endsc 1999; 49: 113-115. 15. Endoscopic removal of rectal leiomyoma: case report. Endosc. 1999 Sep;50(3):433-6. 16. Does flexible small-diameter colonoscope reduce insertion pain during colonoscopy? 17. Features of cap polyposis by magnifying colonoscopy. Gastrointest Endosc. 2000 Dec;52(6):775-8. 18. A case of early-stage primary malignant melanoma of the esophagus. Gastrointest Endosc. 2001 Mar;53(3):365-7. 19. Anisakiasis of the ileocecal valve. Gastrointest Endosc. 2001 May;53(6):677-9. World J Gastroenterol. 2000 Oct;6(5):659-663. 20. Colonic infiltration associated with myelodysplastic syndrome. Gastrointest Endosc. 2001 Oct;54(4):517-9. 21. Uno. The left pinkie maneuver of the colonoscopy. Gastrointest Endosc. 2009 Jan;69(1):191-2. doi: 10.1016/j.gie.2008.05.022.